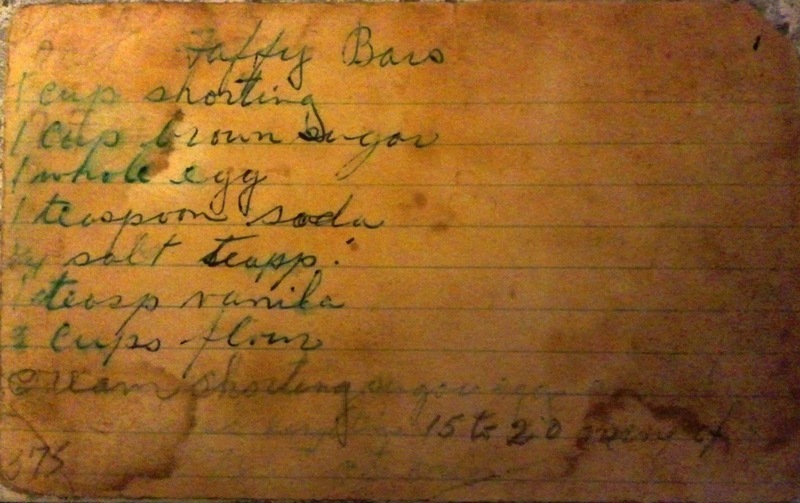 A good while back my Uncle sent me a handful of my Grandma's old recipes. The goal is to go through the stack and make the recipes and document it. The envelope has been sitting there. Waiting for me. I finally grabbed it and decided now is the time. My Grandma loved recipes. She collected them, just like I do. So many times we collect things that are never used. They are just sitting there gathering dust. I don't know if I will be able to make all the recipes. Some of the things no longer exist but I will do my best. 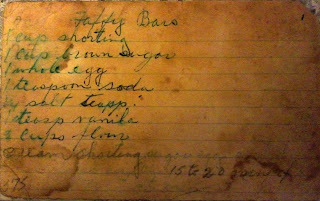 The Taffy Bar recipe as you can see in the picture was very well used. It is a family favorite. Now as I am writing this all I can think of is how good they would be for dessert. Too bad there is cake left to eat. I haven't counted how many recipes there are in the stack. A few, but not too many. This is all that was sent to me, all that could be found. I have already done the Taffy Bars. Next up is Zucchini Ginger Bread. I hope you will follow along with me for this goal. Do you have any recipes from someone special? That is really cool! I have recipes from my grandma but they are all in my head, and I can never make them exactly like she did. Unfortunately, she never wrote any down. Thank you. You should begin to write them down. I have been doing that with ones that have been just passed down by memory too.